Putting points on the board when working inside of the 20-yard line is paramount for offenses to have success, which is, of course, much easier said than done. Here, we preview the league’s best running backs at making things easier for offensive coordinators in the red zone. No surprises at the top of the list, as Saints’ rookie phenom Alvin Kamara, the NFL’s 2017 Offensive Rookie of the Year, took home the crown as the league’s performer inside the 20-yard line at the running back position. The former Tennessee superstar earned an 82.5 offense grade across 88 offensive snaps in the red zone this past season. 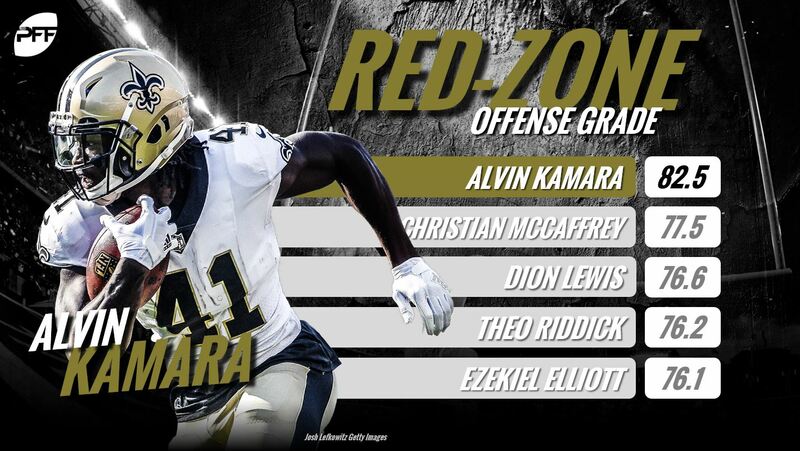 Kamara’s high grade in the red zone was propped up by a 80.9 receiving and 80.0 rushing grades, which ranked fifth and tied for sixth among qualifiers, respectively. He totaled 123 yards (82 after contact), seven touchdowns and four first downs on just 29 carries (4.2 YPC) inside the 20-yard line. He also ranked ninth in forced missed tackles per touch (0.24) and yards after contact per attempt (2.8) among backs with at least 10 red-zone attempts. Panthers running back Christian McCaffrey, a gadget player drafted eight overall by the team in 2017, earned just a 60. 1 rush grade in the red zone this past season, ranking No. 12 among qualifiers. But his play as a pass-catcher near the end zone made up for his play on the ground. McCaffrey led all NFL running backs with at least five red-zone targets in red-zone receiving grade at 91.4, catching 11-of-13 targets for 61 yards (32 after the catch), four touchdowns and four first downs in the process. His passer rating when targeted (125.8) ranked ninth among the same group of backs. At 5-foot-11, 205 pounds, McCaffrey’s unique combination of quickness, agility and speed create for a dynamic pass-catching back with upside carrying the football in space. His role, of course, is still being determined in the Panthers’ offense, but if he does anything in 2018, he’ll be fine catching passes near and inside of the goal line. The 5-foot-8, 195-pound Dion Lewis isn’t built to bully his way up the middle in goal-to-go situations, but his skillset still adds value to red-zone offenses, as evidenced by his usage with the New England Patriots and third-ranked red-zone offense grade (76.6). Prior to joining Tennessee this offseason, Lewis put together a career year with the Patriots, wherein he ranked fifth in total red-zone touches (52) and 13th in percentage of touches resulting in a first down or touchdown (32.69). He also ranked fifth in both rush grade (68.6) and receiving grade (90.2) across his 73 red-zone snaps. Lewis’ pass-catching ability close to the goal line is his strength, as he caught 13-of-13 catchable targets for 80 yards, three touchdowns and three first downs with New England a year ago. Titans RB Derrick Henry will surely take care of the short-yardage carries close to the goal line, but Lewis will likely handle the rest of the red-zone work to the aid of the Titans’ offense. Detroit’s six-year veteran running back Theo Riddick snuck into top-five of this list for his efforts on the ground and in pass protection. Riddick earned the third-ranked rush grade (82.3) in just nine attempts, as he took his limited opportunities and turned them into 34 yards (3.8 YPC) and three touchdowns. He also forced four missed tackles and racked up 26 of his yards after contact on those carries. Despite his small frame (5-foot-9, 201 pounds), Riddick was similarly efficient in pass protection, allowing just one hurry in 10 red-zone pass-block snaps. 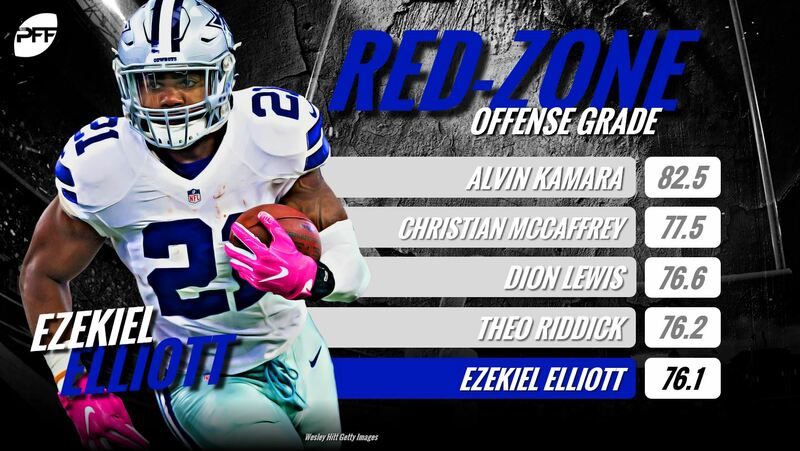 Opposite to most of the backs on this list, Cowboys’ Ezekiel Elliott wasn’t a pass-catching nightmare for defenses in the red zone but instead an efficient runner on the ground. The highly touted Ohio State product rushed for 121 yards (78 after contact), six touchdowns and seven first downs on 40 red-zone carries in 2017, all fueling his third-ranked rush grade (79.3). Catching just three passes for 15 yards and a score in the red zone, Elliott will need to bring more to the table as a pass-catcher out of the backfield if he is to improve his red-zone offense grade moving forward. But, such improvement is within reach barring an increase of targets and sustained success on the ground when Elliott and the Cowboys do get inside the 20-yard line.